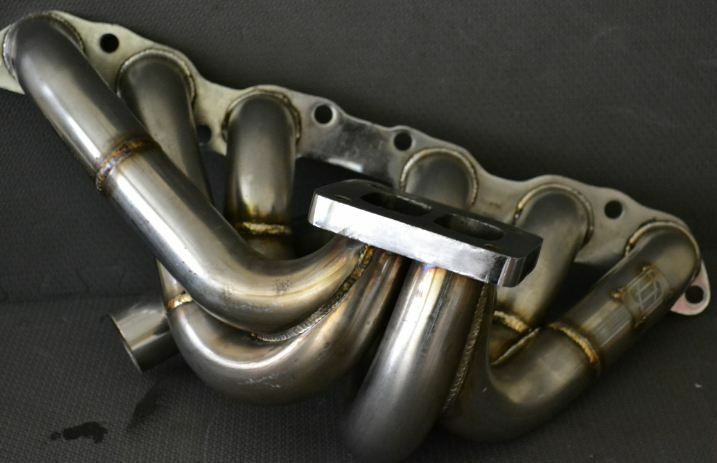 Turbo Manifolds & Down Pipes - NA-T Turbo Manifold for N/A Non-Turbo Supra Owners!! Our team at SupraStore.com have been involved in the 2JZ world for quite some time, with our founder - Mark owning the first stock block 1000hp Supra in the world all the way back in 2001. For years people have been asking why you must pay $1700+ for a turbo manifold. I understand it takes time to engineer, test-fit, build a prototype, then build a jig, just to offer a header. This costs money and quality fabricators (check out our x-ray verified welds!!) are not cheap either. Our goal was under $1000 for a world-class hand-made manifold for the Supra community, which we have been a part of longer than any business on the planet. We all know you can buy a manifold from China for $150 and at the end of the day, it is a manifold from China for $150, enough said. Our manifold is SupraStore built, we control it, we build it, we offer it to you for less. If it does not have our logo spot-welded on it, then it is a copy. Our 304SS tig welded 2JZGE non-turbo exhaust manifold scavenges like none other on the market, with efficient runner designs and a proven collector, that is specifically engineered for the higher compression 2JZGE motor, to take advantage of increased exhaust energy from the higher compression. In most cases, you will likely need to run a V6 4Runner distributor cap and rotor. They are finished in a brushed-stainless "raw-look", but we can ceramic coat them at extra cost, if that is what you require. They are robust, handle heat cycles correctly and are guaranteed to perform. The No. 1 runner is designed to provide maximum clearance for larger compressor cover turbochargers, while at the same time providing for an efficient overall layout. ProSeris turbo manifolds are offered in un-divided (standard 6:1) and divided for those wanting to run twin scroll turbos like the 6266, 6466 or 6766 from Precision, as well as Quick Spool Valve version. The QSV version sits approximately .750" or 19mm lower, to add additional room for the the QSV valve which is mated to the turbo flange. No one in the world builds a QSV specific NA-T manifold. 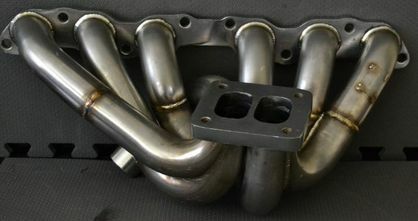 ProSeries turbo manifolds are hand-made in a jig (to offer consistency) and have amazing welds, and the fitment is outstanding. These are configured in either T3 or T4 designs. We also include a 3 year warranty on all ProSeries exhaust manifolds sold! Why offer a T3 manifold on a 2JZGE? Good question! The reason is simple, as there are many global customers who like the smaller T3 turbo's, so why not give them what they want? If you require a TiAL, Precision, standard square gate flange, or other branded flange welded in, this is available as an option in the drop down menu. If you require another type of wastegate flanged welded, please select "Other" in the drop down menu and make a note in the comments section of the type of flange required and our staff will contact you to confirm details. If no wastegate flange is selected you will receive the manifold with the standard length wastegate tube "open" to mount whatever you want. * Quick Spool Valve Turbo Manifolds are Available. Please see our other item listing for that specific version *.